Hello, hello! We have Little Edibles for you today! As someone said, deliciously sweet and 0 the calories! Elena shows off all the sweet edibles on her card, pairing it with sentiments from Heartfelt Wishes and Cross my Heart. We love how they pop against the neutral backdrop! 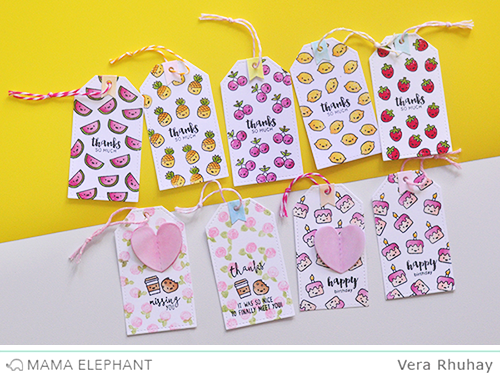 We love these cute tags from Vera, she combined Little Edibles with mini Messages stamp set. Oh my gosh! These are just to cute for words but I will try to come up with some! LOL Adorable, cute, funny, precious, sweet and yummy. I may have to win these or buy them but I think I need to have them! Super cute Vera and Elena!!!!!! So cute!! Love this stamp set!! So cute. I should never look. Such a cute card, and Vera's tags are absolutely darling! Oeh, hes, I looooove the one with all the little images! So cute and cool!